Eggstraspecial Goat Yoga @ HARI MARI in Deep Ellum! YOU are cordially invited for GOAT YOGA @ HARI MARI! Come & celebrate get your GOGA on in Deep Ellum at the HARI MARI Headquarters while our herd of pet goats (dressed in their best Easter outfits) graze and jump around (or on) you! The animals and our goat yoga event will be outside, so please dress accordingly. The HARI MARI Headquarters will be open with flip flops, hats, t-shirts and more available for purchase during the event! Please visit www.goatyogadallas.com for additional info! --- We will set aside time after class for extra socializing and picture taking with the goats if you don't get the shot you want during yoga practice! Don't worry, they will hang out with you after the yoga is over! --- BYOM (bring your own mat). This event is bring your own yoga mat. 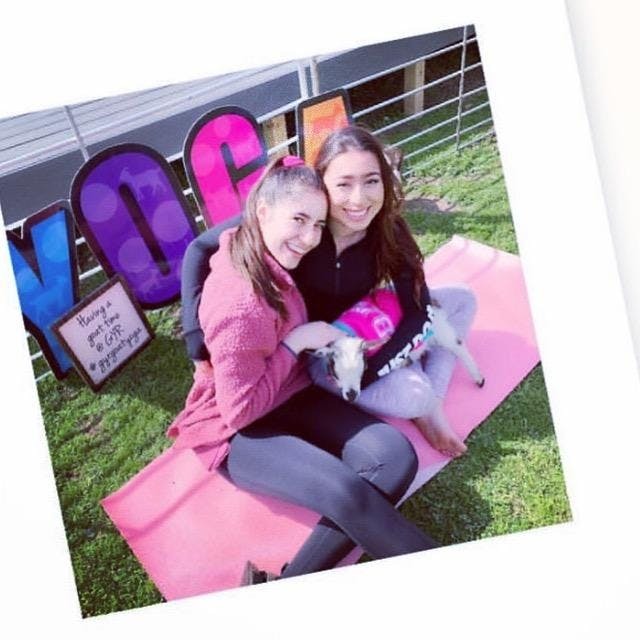 Don’t have one or want a new yoga mat waiting for you at the event? Choose the “Add a Yoga Mat” option during checkout and we will have one waiting for you! Take it with you after the class is over! --- Everyone will need to check-in and sign a waiver before the class starts. --- Please wear something that you don't mind mingling with goats in. Scratches may happen if you are wearing a tank top and a goat jumps on your back. --- You can park for free in the gated parking lot at the Hari Mari headquarters.